Fruit and vegetable gardens burst into bloom in spring and summer for eventual fruit harvest, but rarely consist of one specific plant variety. Gardeners plant a range of their favorite fruits and vegetables for wide, satisfying harvests. Warm-season plants like tomatoes and melons thrive together with the same temperature, sun, nutrition and water needs, but they require generous spacing for growth. Plant these crops at the same time, and with the same considerations. Melons require plenty of space for their vining growth. Start tomatoes, watermelons and cantaloupes in mid-spring when the frost lifts. All three crops need starts at 60 degrees to 65 degrees Fahrenheit, and die in frost. Start seedlings to give these long-season plants head starts on their growing seasons. Designate planting sites. Tomatoes and melons require adequate spacing for growth and fruit production. Choose sites with bright all-day sun and air circulation, and allot at least 5 to 6 square feet for each crop. Put the tomato plot on the southern or northern side of the garden to avoid shading out the lower-lying crops. Amend the soil through all three plots to a depth of 6 to 8 inches. Dig 3 to 4 inches of organic compost into the topsoil to increase nutrition, drainage and moisture retention. Tomatoes, watermelons and cantaloupes are hungry, thirsty plants, and do best with rich, crumbly soil. Turn 6-24-24 or 8-32-16 fertilizer into the top 4 inches of soil throughout to encourage quick root establishment. Plant tomato seedlings 24 to 36 inches apart in a row. Space rows at 4 feet, and give each plant a vegetable cage for support. Plant watermelon seedlings at every 2 feet in the row, and cantaloupe seedlings at 18 to 24 inches in the row. Plant only one row of each variety of melon to minimize space usage. 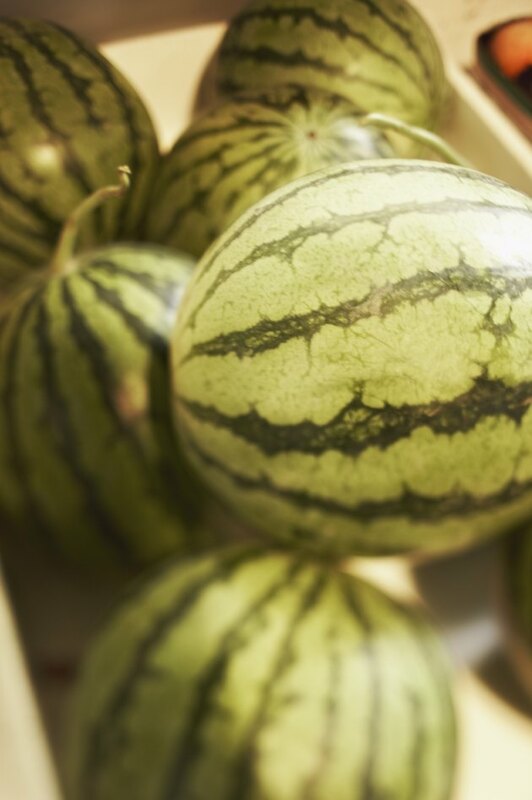 Each plant produces several melons. Give the garden 3 inches of water to settle the soil, and put the plants on a schedule of 2 inches of water every week. The plants cannot produce growth or fruit without adequate moisture. Lay 2 inches of mulch over the soil between the plantings to maintain moisture and warmth for the plants. Feed the plants with a balanced 10-10-10 fertilizer at mid-season to encourage best blooming and fruit production.